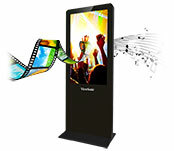 The ViewSonic EP5012-TL is a 50" all-in-one free-standing ePoster digital kiosk with a sleek, slim design. 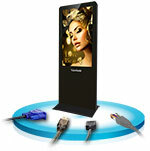 The ViewSonic EP5012-TL is a 50” all-in-one free-standing ePoster digital kiosk with a sleek, slim design. Great for grabbing attention in busy, high-traffic areas, the EP5012-TL comes with a scratch-proof tempered glass faceplate for added durability. Featuring Full HD 1080p resolution, 176°/176° wide-angle viewing, 50-nit brightness, 5,000:1 contrast ratio, 3and dual 6W stereo speakers, the EP5012-TL delivers customized multimedia messaging with vivid clarity. Photo and video files can be played back using the integrated media player and 8GB of internal memory, or directly from a USB hard drive. The bundled ePoster Manager Express Plus software makes it easy to load and schedule customized multimedia content. Flexible HDMI, D-sub, USB (x2), and LAN connectivity also allow for additional content loading options from a PC or networkable media player. The EP5012-TL also features an Android platform, enabling the implementation of customized messaging applications. Simple auto on/off scheduling via an on-screen display, as well as a security lock design, make this a reliable, and easy-to-maintain digital signage solution. The EP5012-TL delivers on-demand advertising and messaging while increasing two-way communication with customers via interactive 4-point touch. With this multi-touch capability, the EP5012-TL is the perfect e-catalog display solution for use as retail, information, and wayfinding kiosks in high-traffic areas. The EP5012-TL features the latest Android platform, making it easy to install Android-based messaging applications directly to the ePoster. This enables users, such as retailers, to deliver more customized messaging to their audience. 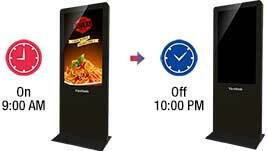 ViewSonic’s EP5012-TL all-in-one ePoster digital kiosk features a sleek and slim premium design, coupled with a free-standing form factor to deliver dynamic messaging in high-traffic areas. It not only looks great, but it’s also durable, utilizing a tempered glass faceplate that offers scratch-proof protection to keep your ePoster looking like new year after year. The EP5012-TL utilizes an energy-saving LED backlight that consumes 35% less power than conventional CCFL backlight displays. This provides for a lower overall cost of ownership, along with a higher ROI, making this display a great long-term investment. The EP5012-TL is equipped with a built-in media player that allows high-quality photos and 1080p video to be broadcast directly on-screen from the ePoster’s internal memory or an attached USB drive. 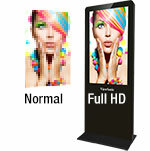 Best of all, this reliable all-in-one e-poster effortlessly displays dynamic content with no crashes, freezes or lost content. 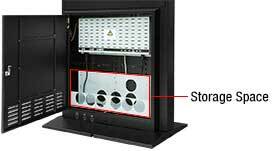 The EP5012-TL is capable of loading, storing, and playing hours and hours of high-definition multimedia content thanks to its 8GB of built-in shock-resistant, solid-state memory. 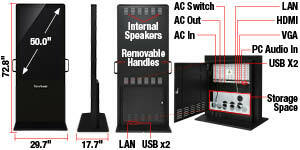 It also integrates a USB port for greater accessibility to different content sources. Great for updating content on ViewSonic ePosters across an enterprise, ePoster Manager Express Plus software lets users remotely transfer multimedia content from any Windows PC or laptop. This software also enables content scheduling and broadcasting cues, allowing you to effectively reach your target audience. Content can also be loaded onto the EP5012-TL via LAN connection or USB hard drive. The ViewSonic EP5012-TL displays content in Full HD 1920x1080 resolution to deliver superior pixel-by-pixel true-color performance. At this resolution and brightness, high-definition multimedia messaging can be seen crystal-clear for a more realistic viewing experience. 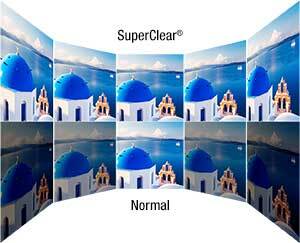 SuperClear image enhance technology delivers 176-degrees of vertical and horizontal viewing angles. Target audiences will experience accurate, vivid colors, and consistent brightness levels whether looking at the screen from above, below, the front, or the side—with no distortion or decay. With a versatile selection of inputs, including HDMI, VGA, USB and RJ45, the EP5012-TL enables you to easily connect a variety of devices and content sources, such as mini-PCs and media players, for straightforward content loading. Best of all, the one-time display installation and setup feature means your preferred source settings are never lost. The EP5012-TL features a convenient backdoor design with internal storage space that can accommodate a PC or an additional mounted media player, giving you additional flexibility when configuring multimedia content sources. The ePoster stand also features an integrated power supply, eliminating the need to find alternative outlets for add-on devices. The ViewSonic EP5012-TL provides an efficient, user-friendly scheduling interface via the on-screen display (OSD). Setup features include time and date scheduling, ensuring that the EP5012-TL runs smoothly and on time. With a pair of integrated 6W speakers, the EP4612-L combines eye-catching multimedia content with high-quality sound effects—creating a lasting audio-visual impression on your target audience or demographic. 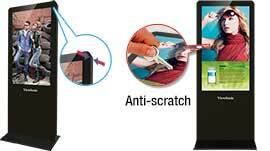 One of the aspects that make ViewSonic a market leader in displays is its dedication to quality. ViewSonic is committed to using the highest grade panels. 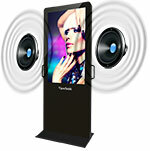 We also back our displays with a 1-year limited warranty for your peace of mind.